I recently attended IIN Live and listened two days of lectures from a dozen or so amazing leaders in the health and happiness movement. I studiously took notes on the good guidance I received, with optimism that at some point I'll review them so what I heard will sink in better, but one message was instantly engraved in my heart. 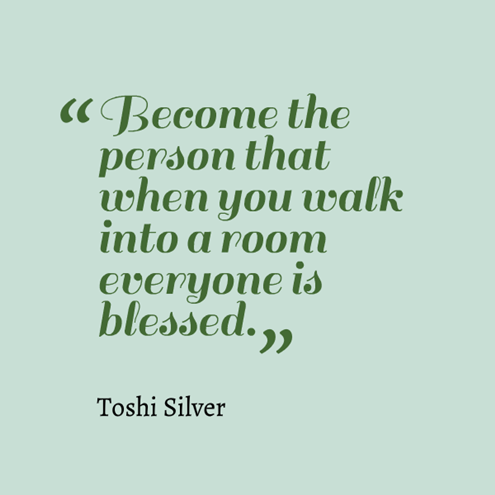 "Become the person that when you walk into a room everyone is blessed." -Tosha Silver, author of Outrageous Openness: Letting the Divine Take the Lead. I also love the Tosha Silver quote because it engages the imagination and spirit. It's not a "do blank and be awesome" command. We need advice and more things to do like we need a hole in the head! Instead Tosha invokes the questions, How can I do this? How can I be a blessing to everyone I encounter? And trust me, you know the answer. Embracing my mission as a votary of the Lotus Sutra and striving for kosen-rufu (world peace through individual happiness). I do this by praying for others, introducing others to the practice, believing in everyone's infinite potential and reflecting that faith to them, and recommitting to be my best self at every breath. Embracing my mission as a health coach. This means listening to others and guiding them to trust and listen their intuition so that they can heal their bodies and spirits. This also means believing in others so that they can believe in themselves. I not only do this with clients but look for opportunities to do this with everyone who could use a little support. Sharing IIN. Studying at Institute for Integrative Nutrition has transformed my life. I am surprised by how many people I meet are actually curious about becoming a health coach or getting an intensive education on wellness so they can heal themselves and their families. I'm happy to be the person in the room letting folks know, "Yup. There's a school for that!" Dancing. It's impossible to dance and feel bad. I dare you to try! It's also hard to see someone else dancing and not dance yourself. Okay, maybe some die hard dance-phobes won't dance but they will at least smile and share my joy. My favorite dance and joy activists are Samuel J. Kirschner, Jess Grippo, and Jeanine the Dancing Chef. What are some ways you can be a blessing to everyone you encounter?